We are registered electricians in London. Our qualified and experienced engineers perform all aspects of the electrical safety certificate. We can provide nationwide electrical safety certificate coverage to big multi-site business and a local service to a smaller business. We aim to perform any electrical safety certificate in the quickest time possible therefore causing you and your tenant the minimum amount of disruption. Electrical Safety Certificate from £99. We also specialise in the installation, Electrical test & non-electrical Safety certificate and inspection for commercial properties, landlords and new homeowners. Call us now on 0207 127 5128. Electrical safety certificates for landlords are provided only after routine checks are carried out to confirm the use of proper wiring, right earthing and the appropriate operation of any safety appliances. A visual examination of all electrical power points (light switches, earth bonding, circuit box etc) also needs to be visually inspected before the issue of a Landlord electrical safety certificate, with these power points being included on the electrical certificate itself. If you are selling or letting your house via a reputable agent you will always be asked for an electrical inspection certificate. A lot of letting agents will choose not to let your home without one. And it is now necessary practice to get electrical test certificates before proceeding with purchase. An electrical safety certificate is the most reliable way to make sure that property is safe from an electrical viewpoint. The cost of an electrical safety certificate for a domestic property depends on the number of rooms, circuits and size of the electrical installation. Time is the primary factor with regard to the cost of the electrical safety certificate. Each circuit needs to be tested and investigated. 1 Bedroom house or flat Electrical Safety Check from £ 110 ( Offer: Check and provide a complete certificate from £115 ). 2 Bedrooms house or flat Electrical Safety Check from £ 115 ( Offer: Check and provide a complete certificate from £125 ). 3 Bedrooms house or flat Electrical Safety Check from £ 125 ( Offer: Check and provide a complete certificate from £135 ). 4 Bedrooms house or flat Electrical Safety Check from £ 135 ( Offer: Check and provide a complete certificate from £145 ). More than 4 bedrooms, please call our office. Commercial Electrical Installation Condition Reports (EICRs) from £ 150. Note: Prices based on a single fuse board/ distribution board with 5 circuits or under. A majority of residential properties will have a fuse board with up to 5 circuits. Additional circuit from: £10.50 each. Please contact us if you are not sure and need help. It is advised that you get a new electrical safety certificate when new tenants move into your property or once a year (whichever comes first). It is very important that as a landlord you always maintain any electrical system under your control to the best of your capability not only for legal factors but also for the safety of your tenants. An electrical safety certificate for landlords is one such document which can show that you did satisfying steps to ensure the safety of electrical system under your control. There is directly no law that mentions a landlord should carry out annual electrical checks, so it’s not truly as cut and dry as Gas safety policies in rental properties, which states the landlord is legally obligated to get a yearly Gas Safety Certificate. Nevertheless, there are different regulations that do apply, but in nearly all cases their requirements just state that electrical systems and appliances need to be safely maintained and installed. If you let property you must assure that the electrical system and all home appliances provided are safe– failure to comply by the electrical equipment (safety) laws 1994 and the consumer protection Act 1987 is a criminal offence. Landlord electrical safety certifications can assure you and your tenants that the electrical systems are safe. The Electrical Safety Council (ESC) advises that the electrical installation is formally examined and checked a minimum of once every 5 years, by a qualified electrician, and a report confirming its condition is issued ( EICR-Electrical Installation Condition Report ). Any remedial work that is needed must be carried out by a registered electrician. Those who manage HMOs have special legal responsibilities on electrical safety certificate under The Management of Houses in Multiple Occupation (HMO) Regulations 2006 (England) and The Licensing and Management of House in Multiple Occupation (Additional Provisions) Laws 2007 (England). Objectives of an electrical installation condition report (EICR) are to:. Record the results of the assessment and test to ensure the electrical installation is safe to be used for until the next inspection (following any work needed to make it safe). Know any parts of the electrical installation that do not fulfill the IET Wiring Regulations. Assist find anything that might lead electric shocks and high temperatures, which can cause burns, deaths, fires and other injuries. Produce a comprehensive record (Electrical Safety Record) of the installation at the time of the inspection, and for inspecting and assessment in the future. Most estate agents will require documentary evidence of testing before they can sell your house. An Electrical Installation Condition Report (EICR was formerly known as PIR) referred to as electrical safety certificate is the proof you will require. 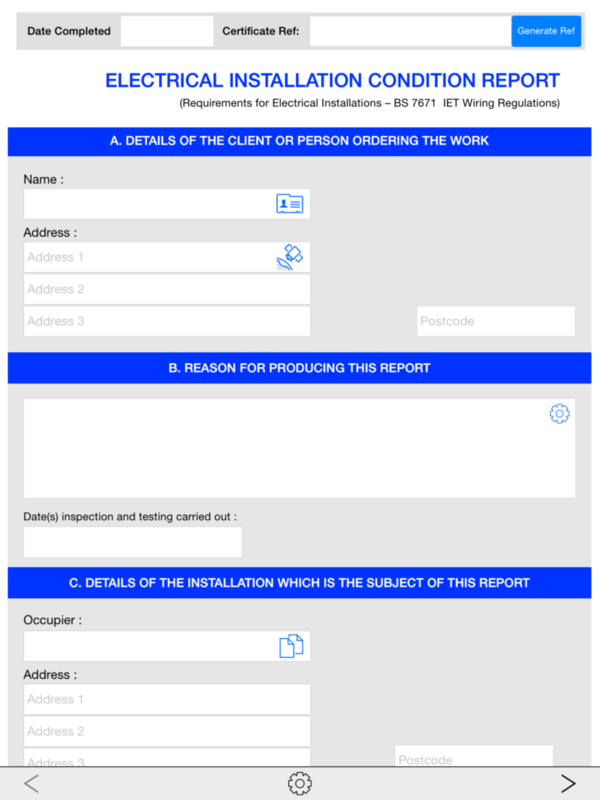 These reports do precisely as the title states and they are an easy to understand and accurate way to record the condition of an electrical installation. On completion of our electrical testing and inspection; we will provide an electrical safety certificate. It is also known as an electrical installation condition report (EICR Certification). The document will outline whether the property has passed or failed its inspections. Your electrical safety certificates will also reveal any recommendations; should the system need upgrading. Call Cenultra today to complete an electrical safety inspection on 0207127 5128.